Took a while, but we finally broke out into the sunshine today. For parts of Downeast Maine, it was all we needed to blossom thunderstorms in Penobscot Bay. Now that everyone is settling down and clearing out, the temperatures should fall back to seasonable levels - generally in the 30s and 40s. Wednesday dawns bright with a quick recovery to the 50s and 60s. Brisk winds from the northwest will ease into the afternoon. It's fire season across New Enlgand. On days with a stiff breeze and low humidity, we run the risk of expanding brush fires with ample dry fuels - leaves, twigs, dead branches - readily available. We'll have elevated fire risk across all of Southern New England tomorrow as high pressure builds in. Friday could be more of the same as the winds turn southwest and the temperatures warm. Although rain remains elusive, there is a chance we could fire up some showers or a thunderstorm on Friday ahead of a cool front. The air is just unstable enough, and the humidity will climb in the afternoon. 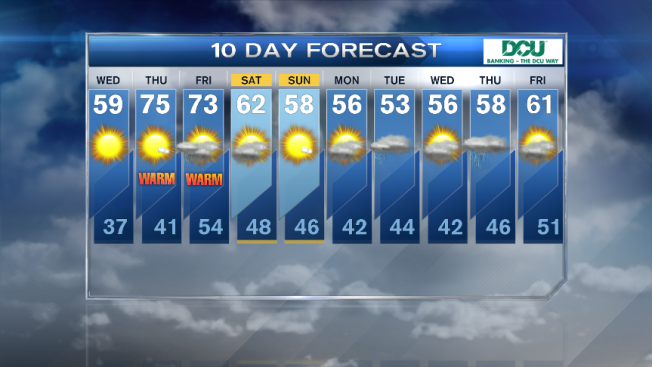 Soak in those 70s...cooler weather is coming for the weekend, and staying well into next week.